Today is the deadline for candidates to file for the 2016 elections — as Democrats, Republicans or independents. And the state's primary elections are only 11 weeks away. For Republican presidential candidates, Texas is the center of the universe — the biggest of the reliable red states and the source of the most electoral votes. It is to the Republicans what California is to the Democrats: the foundation of victory in national elections. Which is why Monday marks the end of one of Donald Trump’s biggest implied political threats. You know the one, the idea that if he doesn’t do well in the primaries that he might turn around and launch an independent candidacy? Today is the deadline for candidates to file for the 2016 elections — as Democrats, Republicans or independents. Trump already filed as a Republican, barring him from running a Texas race as an independent unless he changes that filing by the close of business today. And candidates who run in the party primaries are barred from becoming official write-in candidates (or at least the registered write-in candidates whose votes the state will count). It’s a win-or-go-home state, politically. Trump and all the others will have to get by with just one bite at this apple. The top of the ticket gets the attention, but this is also when the other races in the state firm up, as candidates make last-minute decisions and changes. They file, for the most part, with the political parties, which hand those filings to the Texas secretary of state’s office — the agency that administers elections. Texas’ primaries are on March 1. Early voting runs from Feb. 16-26. Runoff elections are on May 24, with early voting from May 16-20. Expect ballots filled with incumbents and relatively few open seats. As the deadline loomed, only two members of the 36-member Texas congressional delegation — Randy Neugebauer, R-Lubbock, and Ruben Hinojosa, D-Edinburg — had signaled their departures. While others might fall, those two are falling voluntarily. 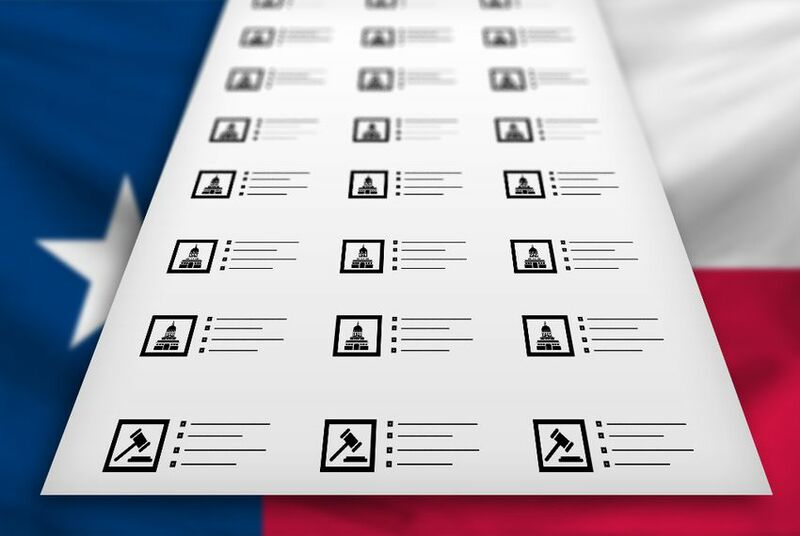 The top of the state ballot — below the races for president and Congress — will feature an open race for the Texas Railroad Commission and six seats on the state’s two high courts. Railroad Commissioner David Porter surprised his fellow Republicans last week by giving up his re-election bid, spurring a stampede of others who are or might be interested in a statewide position. Two of the state’s Supreme Court justices — Debra Lehrmann and Paul Green — have drawn Republican primary opponents. And Judge Lawrence Meyers of the Texas Court of Criminal Appeals will have Republican opposition in November after a primary race for the GOP nomination. Meyers, elected as a Republican, switched parties and is currently the only Democrat in statewide office in Texas. At least three Republicans want to challenge him. Another judge on the criminal court — Cheryl Johnson — is not seeking another term. Only two of the state’s 31 senators — Kevin Eltife, R-Tyler, and Troy Fraser, R-Horseshoe Bay — said they were not seeking re-election. Sixteen of the Senate seats will be on the ballot in 2016, while the other 15 will be on the 2018 ballot. As of Sunday afternoon, there will be a rematch for one of those seats. Sen. José Menéndez, who won a special election earlier this year against Rep. Trey Martinez Fischer, a fellow San Antonio Democrat, will face him again in next year's Democratic primary. State House members serve two-year terms, and all 150 of those seats will be on the 2016 ballot. The voluntary departures account for just 10 percent of them, a list that includes Jimmie Don Aycock, R-Killeen, Myra Crownover, R-Denton, Joe Farias, D-San Antonio, Allen Fletcher, R-Cypress, Patricia Harless, R-Spring, Bryan Hughes, R-Mineola, Jim Keffer, R-Eastland, Susan King, R-Abilene, Marisa Márquez, D-El Paso, Ruth Jones McClendon, D-San Antonio, Elliot Naishtat, D-Austin, John Otto, R-Dayton, David Simpson, R-Longview, Scott Turner, R-Frisco, and Sylvester Turner, D-Houston. Monday’s filings will also reveal the full list of challengers to the incumbents who aren’t volunteering to leave. In the Texas House in particular, factions within the Republican Party have been warring over control. Members of the anti-establishment wing have boasted they will elect enough new state representatives to turn over the management of the House, where Speaker Joe Straus, R-San Antonio, is serving his fourth term as presiding officer. Straus is seeking re-election to his seat and has said he will run for speaker again in January 2017; his supporters will be busy for the next 11 weeks trying to defeat some of the rival faction. Half of the state senators, most statewide judges and all but one of the elected officials in the executive branch have this election year off. Most ran in 2014, and the elections ahead are, for them, just a spectator sport.